'To Kindle or not to Kindle, that is the question. What's a girl to do in this day and age, hey? And particularly, what's a girl who spent 15 years in the book trade to do? For a long time, I resisted the idea of a Kindle, my bookseller's heart rejected the lack of paper pages to flick, the impersonal generic-ness of reading from a screen, the empty feeling of one's hands holding not a wodge of paper but a bit of plastic, and even the absence of that wonderful book smell. And then I left the book trade to finish studying and so as not to work weekends any more (kills your social life with your kids once they're at school! ), and my endless source of free and cheap books, the river that had run through my life for 15 years, dried up in a flash. In the past 2.5 years, I've bought books second-hand, got them from *hangs head in shame* Target, from eBay, from Amazon, read an awful lot of fanfiction (and that's another post! 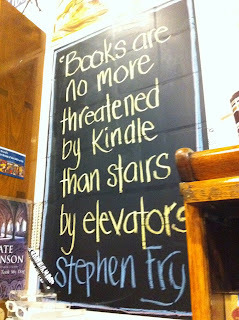 ), even a few times bought them from proper bookshops like Dymocks, and ON A KINDLE (the horror!)!!! Pretty much the only thing I haven't done is join a library, and that's because I'm too impatient to wait for favourite authors on a waiting list (yes, I will die if I can't read the latest Harry Hole or Sookie Stackhouse the week it comes out...). 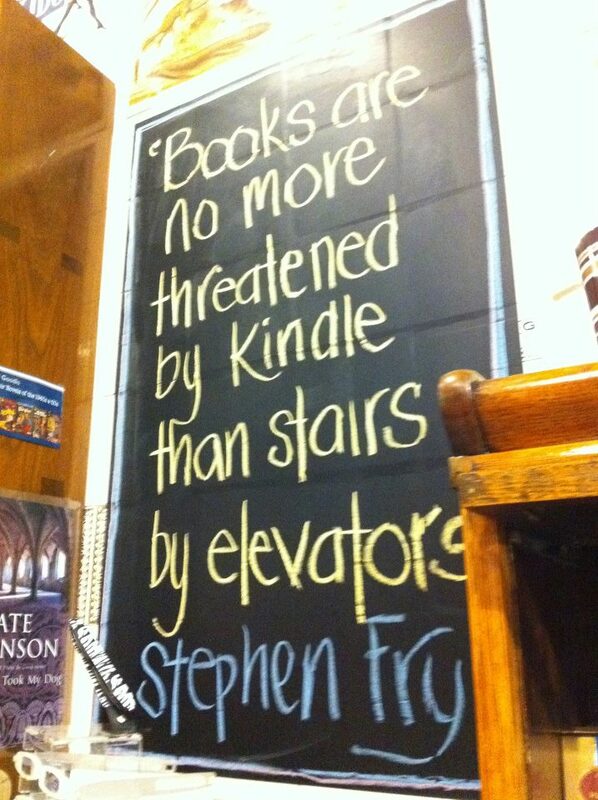 I'm not sure where this pic originally comes from, but it was obviously taken in a real bookshop!! The only downside for me (as your friend) is that now you can't pass the books onto me ... hmmm. I might have to increase my social circle ... anyone know of someone who works in a book shop, likes to drink wine, and occasionally look after my feral child/children?? I use my Kindle mainly to read thick non-fiction books on while commuting. But I'm still in the charity shop every week looking for disposal chick-lit and crime to read in bed, and return the shop. So sometimes a book, sometimes a Kindle. I can't imagine ever going fully electronic; but it is very useful.